Hi. It’s Lois at Recipe Idea Shop, telling you about Don’s Grilled Pork Tenders (tenderloin). 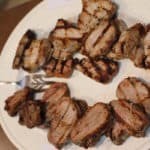 If you have been following our blog for awhile, you know how much I like pork, and pork tenderloin is one of my favorite ways to eat it. There’s a reason it’s called tenderloin; it’s very tender. Don does a great job grilling it up. I like Grilled Pork Tenders any-which-way he makes it. Sometimes he puts some garlic, salt and pepper on it. Other times he adds a Citrus Marinade. Or he uses teriyaki sauce (always Kikkoman’s). Super yummy. And it only takes a few minutes to grill it. He made it two ways this time. Part of it was seasoned with just salt, pepper, olive oil, and garlic. The other part had some Penzy’s Grilling Spices sprinkled over the meat. We had some friends over for supper and everything was delicious. 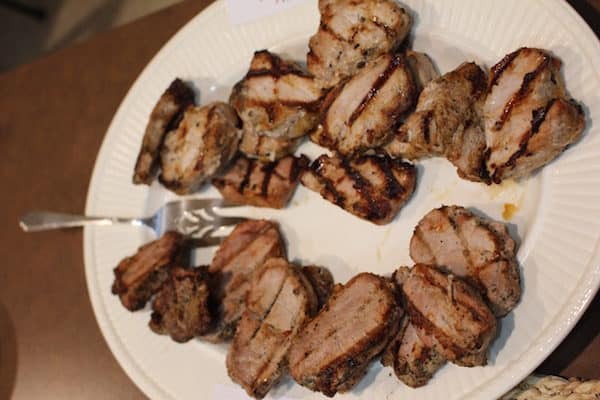 Don made the Grilled Pork Tenders on the outdoor grill, but you can make it on a George Foreman Indoor Grill, too. It only takes a few minutes either way. This time, he put the spices over the outside of the whole tenderloin and grilled it whole using the indirect method, slow cooking the meat over the unheated area of the grill for 30 minutes. Then he sliced and finished the pieces to the desired doneness for each diner over the hot part of the grill. When you try it, be sure to comment and let us know what you put on your grilled pork tenders. 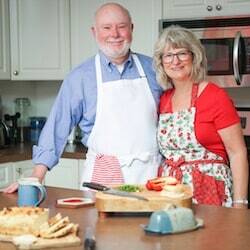 Don used a platter (for marinating and later serving), measuring cup, measuring spoons, garlic mincer, carving knife and fork, cutting board and his gas grill to make this meal. What tools would you use? Mix the garlic, pepper, salt and olive oil until well blended. Brush the spices mixture over the outside of the tenderloin. Let rest for 30 minutes or more. Grill the whole pork tenderloin using the indirect method over a medium-hot fire for about 30 minutes until nearly done (130-140F degrees). When you use the indirect method, you turn off one grill burner (usually the center one) and place the meat over the jet that is not on. 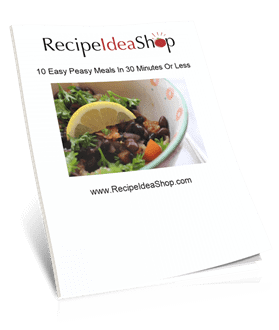 This method cooks the food more slowly, the way an indoor oven does. When the tenderloin is about 135 or 140F degrees, remove the meat from the grill and slice it into one-inch-thick tenders. Return the slices to the hot side of the grill to finish cooking to the desired doneness (about 145F degrees).. Remove the tenders from the grill and let rest a couple minutes before serving. Grilled Pork Tenders Nutrition Label. Each serving is about 1/4 pound, or 2 slices.